Continuing on from my last article, a general ramble about Indian cuisine, this post will cover some fundamentals ingredients you will need to make your own Indian dishes at home. First, there is no such thing as a "curry", properly speaking, and neither is there any such thing as "curry powder". If you see a mixture advertised under that name, avoid it entirely. It is probably mostly stale turmeric. Curry is a leaf that gives flavour in combination with other spices. But for the sake of convenience we do indeed call a dish that has a certain mix of spices and a rich gravy a "curry". Even I do that, realising the simplification I am making. No-one is going to get called on orthodoxy here! 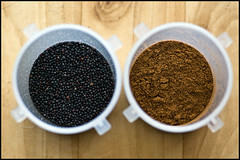 What some call "curry powder" is more properly garam masala, which simply means "hot mixture". This mix of ground spices can include peppercorn, cardamom, coriander, cumin, mustard seed, turmeric, fenugreek, cloves, ginger, chilli powder, asafoetida, curry leaf or indeed other ingredients. Every cook prepares it differently; some can be hotter, some can be sweeter. You may wish to have more than one preparation in stock, for different flavour possibilities. Of course it it also easy to make this yourself. All you need is a mortar and pestle plus the fresh ingredients. At one point in my life I did this, but now simply buy the mix from an Indian food supplier. But I always add a certain amount of fresh spices, along with the garam masala, to each dish. Garam masala is used in different ways. Some cooks would have you brown (or "roast" or "toast") it in a quantity of hot oil before adding other ingredients. Personally, I find this stifles the flavours. Not to mention it burns easily and then produces a truly noxious smoke. A second way to use it is to cook it into whatever dish you are preparing. This produces a warm rich flavour. The third method is to simply sprinkle it on top of the finished dish, which creates a raw and sharp experience. I don't think you would often find this done in a European Indian restaurant but you certainly would at a table in India. A second important ingredient in Indian food is ghee, which is nothing other than clarified butter. Although certain traditions say this is healthy, even sacred, a more commonsensical outlook would have us avoid any ingredient that is one-hundred percent animal fat. But it should be noted that pure ghee is completely free of lactose and has been found to have a good effect on cholesterol in the body. It stores well without refrigeration and has a high smoke point so it does not burn with cooking. It is possible to make Indian dishes without ghee, though they may not have the overly-rich flavour some have come to know. Realise, however, that the fancy dishes presented in restaurants are not based on day-to-day foods of India. No-one could eat restaurant food daily and be healthy! One reason is the insane amounts of salt used in commercial Indian food production. Next time you are enjoying a meal at a restaurant, think consciously of the flavour of salt in your mouth and you may be surprised! We can consume a great amount of this seasoning without realising. For my own dishes I do not cook with ghee and add very little salt. This results in a very different Indian food experience that some have enjoyed, even if they had not previously liked the restaurant versions. In my next instalment I will finally get to a recipe!